Freshman Jacquelyn Burrer plays the flute at the Homecoming pep rally. During pep rallies, Burrer has to switch from her cheer routine to her position in band. Freshman Jacquelyn Burrer hears her coach’s voice echo through her mind as she finishes her last backflip. Then, she runs to the shiny silver instrument she calls her best friend. Burrer has a lot on her plate trying to balance both band and cheer. 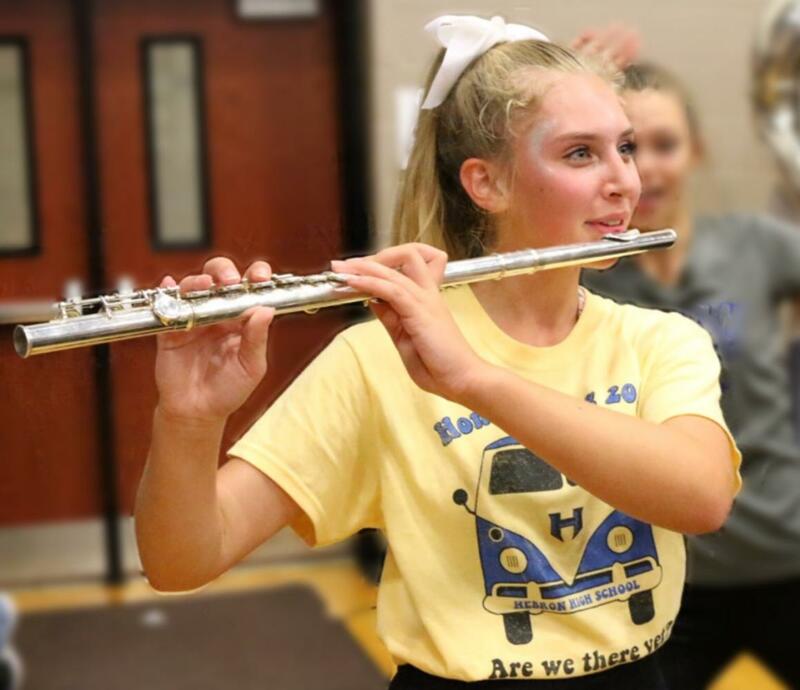 Her sister, Laurel, influenced her to choose the flute to play in band. Burrer had been a gymnast since the age of 6 and loved doing back flips and cartwheels. Due to a wrist injury, Burrer had been pulled out of gymnastics, missing her chance to shine at an international gymnastics competition. Despite the amount of stress and her broken wrist, nothing stopped her from trying out for cheer in eighth grade. Due to the overlapping schedule of band and cheer along with her classes, Burrer says she barely has time for herself or her family. Burrer’s best friend, sophomore Abigail Rieger says Burrer manages to light up the room with her personality, regardless of the amount of stress and pressure she goes through daily. Cheer coach McKenna Baxter believes Burrer prioritizes band and cheer equally. As of right now, Burrer does not have a solid plan for college, but she plans on pursuing cheer and band all four years of high school.